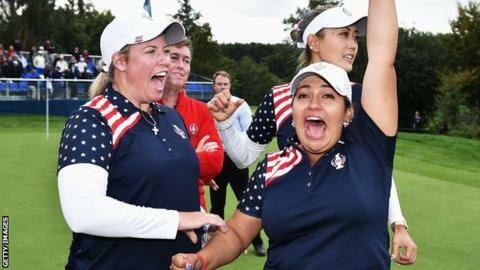 The USA produced a stunning display in the singles to beat Europe 14½-13½ and win the Solheim Cup in Germany. Juli Inkster's team trailed 10-6 after the morning fourballs, but won eight and a half points from 12 singles to regain the title they last won in 2009. However, the contest was marred by controversy over the issue over the non-concession of a short American putt in the fourballs. "After this morning they were all fired up," Inkster said of the incident. "The girls were awesome. Everybody did their job. I couldn't be more proud of them." Annika Sorenstam, assistant to Europe captain Carin Koch, said: "The US came out very strong and played very solid. There were some crucial matches at the end." Click here for the full day-by-day results of the 2015 Solheim Cup. It was one of the great matchplay comebacks in recent golf history. The USA were fired up after the earlier fourballs, delayed from the second day, in which Alison Lee and Brittany Lincicome lost to Charley Hull and Suzann Pettersen by two holes in controversial circumstances. Michelle Wie, winner of the 2014 US Women's Open, led the way in the singles with a superb 6&4 victory over Caroline Hedwall, before Gerina Piller sank a nine-footer to win her match against Caroline Masson and deny Europe the half-point they needed to retain the Cup. Lee, Morgan Pressel, Lizette Salas, Angela Stanford and Cristie Kerr were also victorious before Paula Creamer secured overall victory with a 4&3 success over Germany's Sandra Gal. Karine Icher and Melissa Reid were the only Europe players to win their matches, while Carlota Ciganda halved her battle with Lexi Thompson. This was a tournament played in relatively good spirit - until the incident early on the final day that is now part of Solheim Cup folklore. The score was 8-5 overnight, with three of the four fourball matches carried over to early Sunday morning because of bad light at the course in southern Germany. After a victory apiece in the first two matches, the focus was on the contest between the USA's Lee and Lincicome and Europe pair Hull and the two-time major winner Pettersen. "The rulebook was followed on the 17th green but the spirit of what happened was disappointing. There was fault on both sides. "The putt was only 18 inches and Europe profited from nothing more than a breakdown in communication. "Had Europe played to the spirit of the game rather than the letter of the law they would still have enjoyed a healthy lead and a controversy that threatens to overshadow the match would have been avoided." At the 17th, Lee missed her birdie putt to win the hole and picked up her ball as Hull walked away, assuming Europe had conceded because the follow-up was a formality. However, Pettersen spoke to the referee and said there had been no concession, which meant the Americans incurred a penalty stoke and therefore lost the hole. Both Hull and Lee, playing in her first Solheim Cup, had to be consoled by team officials amid claims Europe had broken the game's moral code by not conceding from such a short distance. Four-time major winner Laura Davies blamed Norwegian Pettersen, 34, and said England's Hull, 19, was not at fault. The Hall of Fame member told Sky Sports: "I am disgusted. Suzann has let herself and her team down." US captain Inkster thought Europe's action was "disrespectful". She added: "I couldn't believe it. I saw Suzann walk away. You don't do that to your peers. I expected Carin to do something afterwards but she didn't." Europe captain Koch said it was Lee's mistake, adding: "Our team didn't concede the putt. She picked it up. It broke the rules. "We considered changing the outcome but we would not have given the putt. They would have made her putt it. So, no. "We all feel bad for Alison but she made a mistake." American player Creamer added: "This game is about sportsmanship and unfortunately that was not shown there. I wasn't a part of that match, but it's a game of golf and we have to remember that."